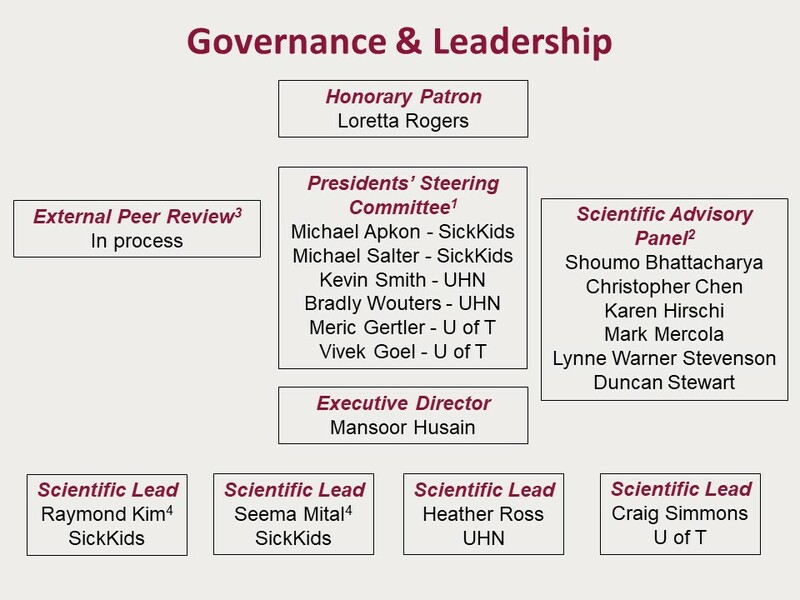 The Presidents’ Steering Committee comprises each CEO/president and each vice-president of research at The Hospital for Sick Children (SickKids), University Health Network (UHN), and University of Toronto (U of T). The Scientific Advisory Panel includes international experts from the University of Oxford, Boston University, Yale University, Stanford University, Brigham and Women’s Hospital, Harvard University, and the University of Ottawa. The Ted Rogers Centre for Heart Research is establishing a permanent External Peer Review to analyze and critique the direction of research as well as funded projects. Drs. Raymond Kim and Seema Mital are co-scientific leads at SickKids, leading the Cardiac Genome Clinic and Precision Medicine initiatives, respectively. Dr. Ronald Cohn, chief of pediatrics at SickKids and chair of pediatrics at U of T, served as scientific lead for the Centre. Dr. Sarah Bowdin, physician and geneticist at SickKids from 2008-2017, served as scientific lead for the Centre. Peter Zandstra, founding director of UBC’s School of Biomedical Engineering, served as scientific lead for the Centre. Janet Rossant, senior scientist at SickKids’ developmental & stem cell biology program, was an early pioneering researcher for the Centre.